Open daily throughout the golf season and on Thursday, Friday, Saturday and Sunday during the off-season. Check our homepage for details of our many special dining events. A full fine dining menu and beverage list are available in the evening while lunch offers a lighter fare as well as full menu. Enjoy dining in this impressive room with its panoramic windows overlooking the 10th and 18th holes as well as the majestic St. Lawrence River. Open daily for golfers both before and after their rounds. 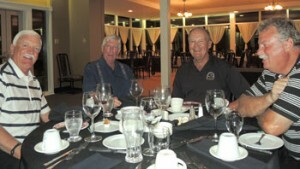 The dining room menu is offered here as well as “to-go” orders for those finishing their first nine holes. This inviting space features a sweeping view of holes #1 and 18. The lounge is the perfect setting for large weddings and special events. Open daily and offers a more relaxed setting for food and drink before or after your round of golf. With comfortable seating and large screen televisions, this cozy and inviting pub is a perfect spot to celebrate another day on the links. Weather permitting, food and drink are served on this multi-level terrace surrounding the 18th green. This patio is also offered to wedding and special events as their own private outdoor area. Weather permitting, food and drink are offered on this raised terrace with views of the first tee and the ninth green. 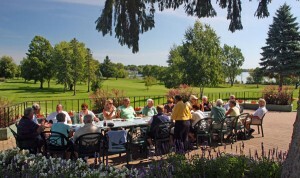 This patio is reserved for golfers and members when weddings and special events take place. 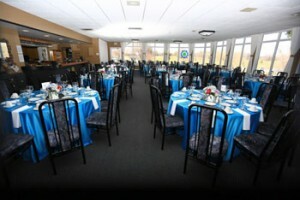 The Club would be happy to host your wedding, banquet, business meeting/luncheon or private dinner party. Ample parking space is available and we are handicap accessible. offer a range of services to ensure that your event is a grand success. Our Head Chef, Mike Anderson, always goes the extra mile to help you to create your own customized menu and discuss all of your special needs. Let our professional team help you make your day truly a memorable one! This chart of room layout and occupancy will help with the planning of your special event.